I can't believe I haven't shown you all these village scenes before! My mother has been collecting Department 56 miniatures for over 20 years. I think she started because I was so obsessed with all things dollhouse. I took these with my phone at my mom's place; I'm really determined to try and learn how to use my camera phone a little better, so I apologize for the lack of clarity. This scene here is from a collection called New England Village, which is my favorite. 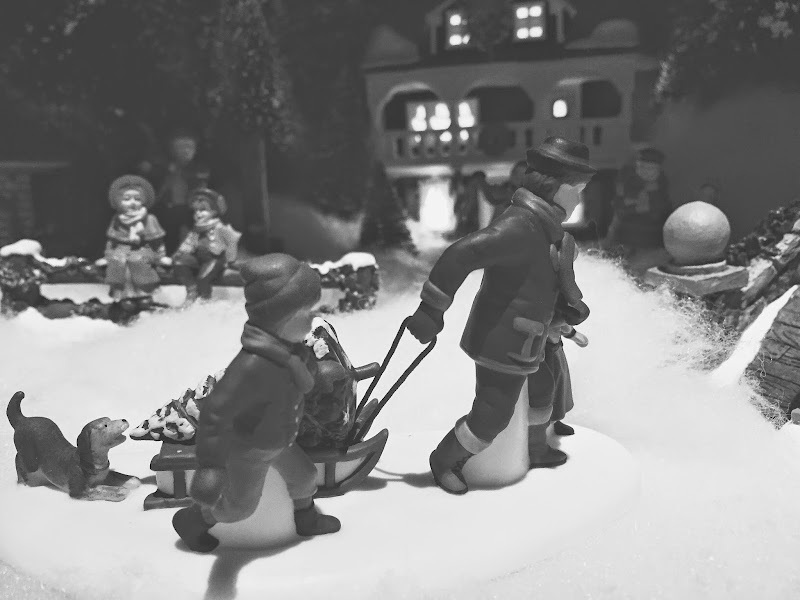 She also has Christmas in the City, which is our 2nd favorite collection, and the North Pole, with a few odd pieces of Dickens thrown in. I just found out that there's a DOWNTON ABBEY series beginning, but I think we'll have to restrain ourselves, because my mom's collection far exceeds anything we can possibly manage. It really is like dollhouse-ing for grownups! And when the houses are lit up at night...so pretty. I have a sideboard/cabinet thingy now that I got at IKEA, and I'm thinking that next year, it might be time for some of the village collection to come live at our house and I can make a display up on top of my cabinet. And then I can have loads of fun moving the little pieces around. And around. One year we made a skating pond for this village, by burying a small mirror in the 'snow' (pulled apart cotton with white glitter sprinkled on top). SO MUCH FUN. 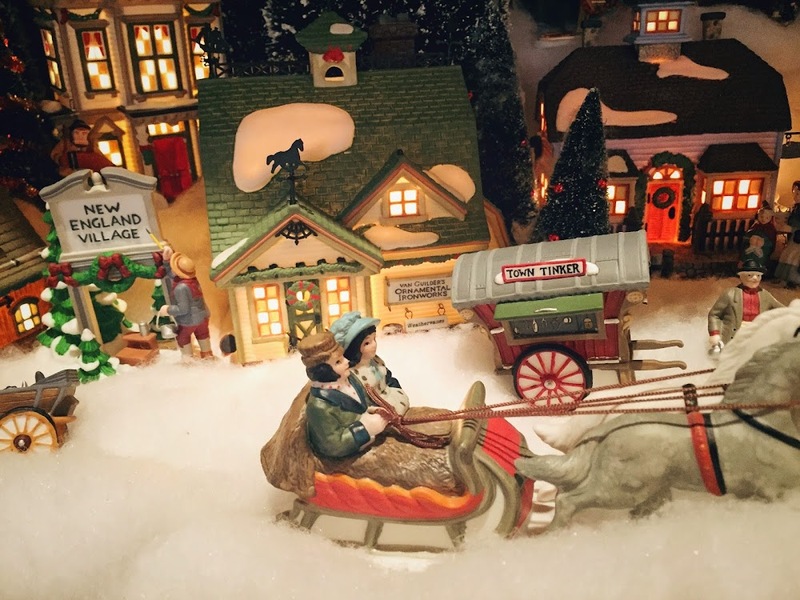 I love Christmas villages, especially Dept. 56! What a wonderful treasure you have in your mom's collection. they really are just magical. there's a nursery that sells the whole lot of them, and we go during the holiday time to see all the scenes that have been created, it's really spectacular! Oh, beautiful! 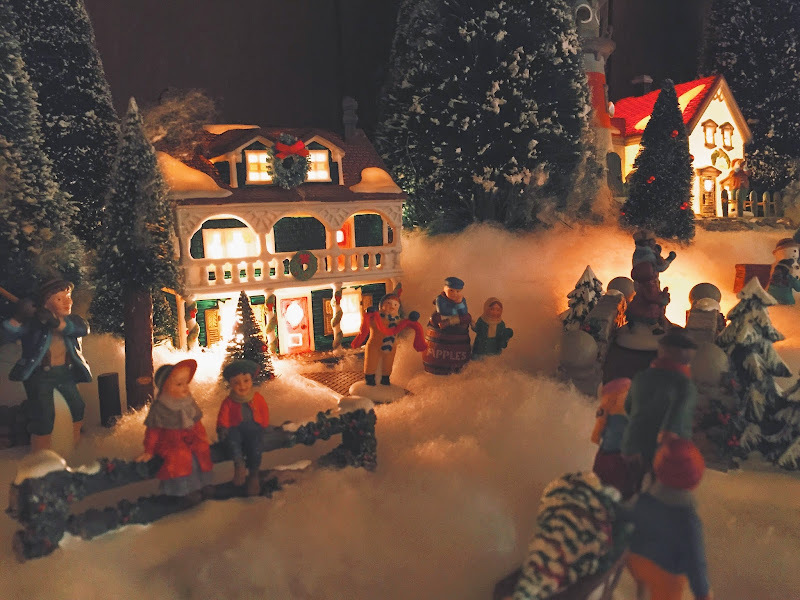 I would love a Christmas village, but I have nowhere to display one, without having to find homes for a lot of other stuff. I love your mom's and yours! You know, I've found that I spend way more time "working" with my daughter's dollhouse than she does "playing" with it. All that tiny stuff! I love it! I can totally see how people get sucked into miniatures. This display could keep me entertained for a while, for sure! Oh man, I've been wanting to totally revamp our ('our'!) dollhouse for a couple years now, but that's going to entail many hours on ebay and/or dollhouse sites scouting out the pieces I want and I just haven't made that happen yet! But I will. I really don't like playing dollhouse all that much, never did - I just like setting everything up and moving things around!! Your mother has an awesome collection! Oh please do take a big picture one day of the complete shelves? 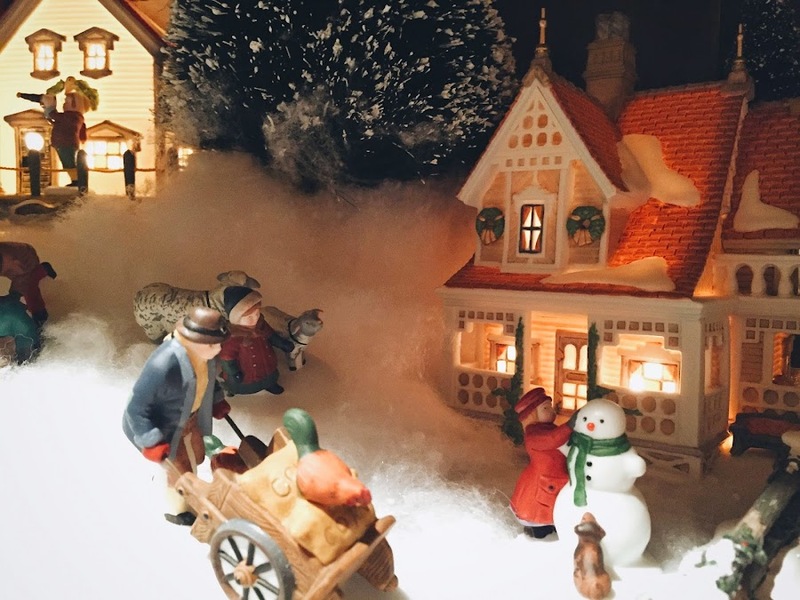 I adore dollhouses and even more lighted dollhouses! 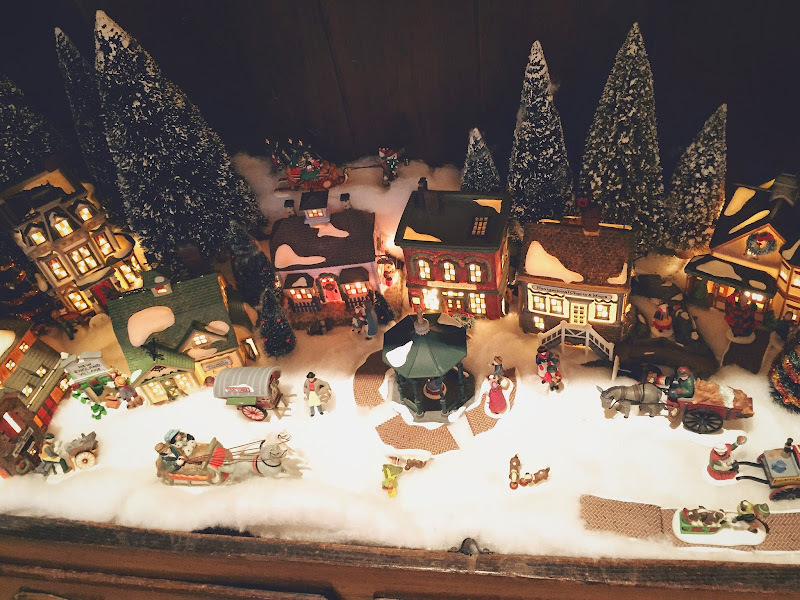 I would have started a Christmas village already if it wasn't for the lack of space in my tiny apartment. I'll admire vicariously other people's village as consolation. I will go back and take a full view shot of the entire armoire with both shelves on view! It's impressive. Also impressive...the amount of space all her stuff takes up - I would have nowhere to store 1/200th of what she has at my place!